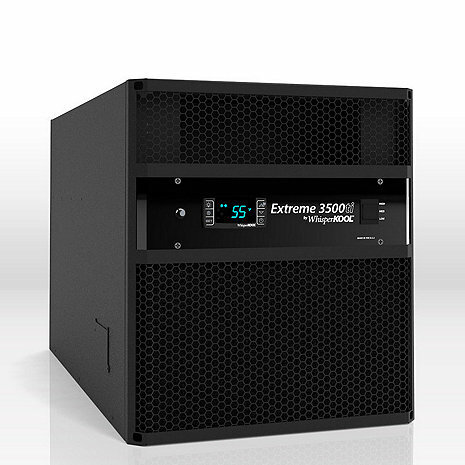 The Extreme Series offers 3-speed fans to truly put full control in your hands. With the system set in the Low setting, you can maintain a 55°F cellar at an ultra quiet 51 decibels for the 3500ti and 5000ti, or 57 decibels for the 8000ti. This fully featured line also includes WhisperKOOL's most advanced controller to keep all of the cellar vitals in check. Utilizing a series of monitoring probes inside the unit, the controller is able to ensure efficient high performance and long cooling unit life. Acceptable for mounting through exterior walls and can operate in a 110°F exhaust environments. Maintain 55°F and 50-70% relative humidity in a cellars up to 800cu. Ft. (3500ti) in size. Maintains 55 degrees and 50-70% humidity in cellars up to 800 cu ft.
Cellar Size 800 cu. ft.
What are the voltage requirements? 20 Amp dedicated line is recommended. Can this unit be exhausted to the outside direct from the wine cooler..meaning can the exhaust be on the exterior of the house? I want to install on a wall that is on the outside wall of the house? With it being exposed to the elements will I have any problems? Do I need to use my bottle probe or is it ok to just run off the thermostate? BEST ANSWER: You can run off the thermostat but the bottle probe is really the best, most accurate way to maintain wine bottle temperature rather than the ambient cellar air temp. Ambient temps can flucutate quickly when you open the cellar putting additional stress on the unit. You can run off the thermostat, but we do use our bottle probe. We love our cooler. what is the exhaust air temperature on an extreme 3500ti? The platinum extreme has exceeded my expectations.It was easy to install and has kept my cellar at proper temperature off my garage in the heat of Alabama. After 12 years of solid performance, I replaced my original Whisperkool 3000 with the 3500ti. So far, the 3500ti is far superior-much quieter and runs less often. Considering the $ investment in a 600 bottle wine cellar, i think it is well worth the extra money and I highly recommend it. Has more fan noise than what i thought it would have. Low speed not to bad, medium and high speed to noise. Keeping mine on low speed seems to be doing the job with ambient temps in the 80s hope it does the job when ambient gets 90-105 degrees. So far, I am pleased. However we have yet to start the cooling of the room. You can check back with me in about 3-4 weeks when everything should be up and running. I finally had the good sense to contact one of the specialists at Wine Enthusiast. I have had two cooling units the past 6 years and learned from the specialist the old units were not appropriate for my cellar. With the specialists help I now have the perfect cooling system. I am very pleased.